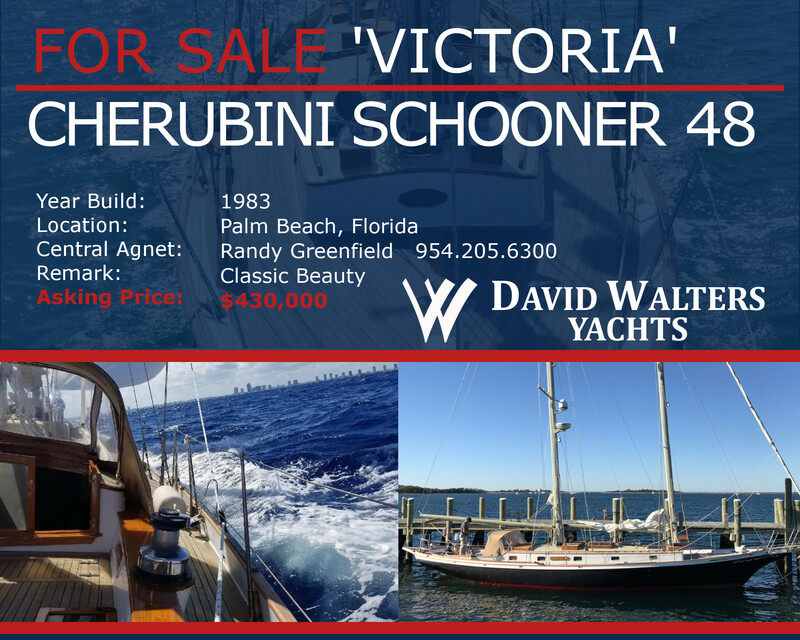 VICTORIA is a stunning Cherubini Staysail Schooner 48 located in Palm Beach, FL. The Cherubini 48 is a “go anywhere” boat, designed and constructed for the rigors of the long passage, yet capable of exploring the hidden backwaters of the world with its Scheel Keel drawing only 5 feet, 10 inches. She reserves the classical appearance of yesteryear while offering the strength of fiberglass construction. Hand-finished teak, highlighted by custom stainless steel and bronze fittings and ports, incorporated with the latest construction methods and materials, will tell you that this is a yacht crafted with care and an understanding of the sea. Below deck, the same high standards of quality and traditional elegance have been carried throughout. The standard layout is designed to accommodate a cruising couple with occasional guests very comfortably.